with their Lou & Grey line. It's so soft! This cowl tunic is perfect for nursing, especially if you have to nurse in public. 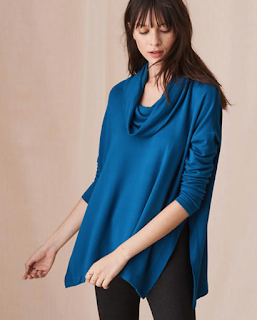 I purchased it in both blue and black because it's so cozy, stylish and practical. You can pair it with leggings (covers my behind) or jeans, and wear with sneakers or dress up with booties or tall boots. I've been wearing a nursing bra and a nursing tank top underneath, and the poncho is long enough to full cover baby Xavier's head and body while he's nursing. It's $59.50 but I got it on sale over Labor Day weekend for 40% off. What are your favorite nursing items? Please share in the comments! Comfy and attractive nursing tops are so hard to find! I nursed both of my little ones for 2 1/2 years. I usually went with a nursing tank, and then a button down shirt over that. I've never nursed, by I love the LOFT in general - I actually just bought a shirt there this past weekend. Ann Taylor itself is nice too but tends to be fancier/more office-appropriate clothing. No nursing items for me but I LOVE Lou and Grey tunics - they are SO comfortable!